portlet configuration(serviceName) can't import properly. 1. Create one site template "siteTemplate". 2. 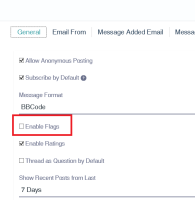 Go to "siteTemplate" control panel->Message Board->Configuration, uncheck "Enable Flags" and change "Message Added Email" body content. 3. Export this portlet as MB.lar. 4. Create one new site template "siteTemplate1". 5. Go to "siteTemplate1" control panel->Message Board->Export/Import, import MB.lar. 6. Go to "siteTemplate1" control panel->Message Board->Configuration, check configuration. Step 2 doesn't take effects.